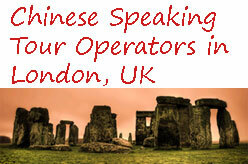 Chinese Speaking Tour Operators in London. Chinese Speaking Travel Agency in London, UK. UK’s Chinese Speaking inbound tourism companies and outbound tourism companies. UK tour operator to provide tours that are run and guided by native British Mandarin-speaking guides, for Chinese visitors to the UK. China based travel company expert on UK China travels. Offers bespoke tour in the UK and Ireland, Themed travel (family tours, football tours, golf tours, garden tours, conference & incentive tours, and summer & winter vocation tours) and classic travel services. Chaoyang District, Beijing, 100026, China. Room1703, Jinxiao Building, NO.36 Bi Quan Road, MinHang District, Shanghai, 201199, China. Jianye District, Nanjing, 210000, China. Address : 78 Shaftesbury Ave, London W1D 6NE, UK. UK based China-European DMC. Offers luxury travel services to Chinese groups coming to the UK and mainland Europe. Tour guides speaking most languages including French, German, Spanish, Italian, Russian, Japanese and Chinese. London W1B 5TE, United Kingdom. London based travel agent and tour operator offers tailor-made UK inbound and European tours, international travel and related services. Travel & Hotel Booking, Tailor-made private tours, luxury biz+leisure packages, Business & Conference, Ticketing (EuroStar, Air tickets, Train Tickets, UK Atractions), Car & Coach Hire (chauffeur service available).